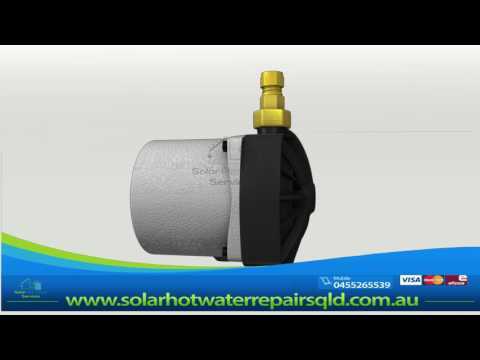 Solar Hot Water Repairs QLD regularly use the Grundfos 15-20 CIL solar hot water circulating replacement pump in the majority of our solar hot water repairs. The Grundfos 15-20 CIL2 can easily be be fitted to all open loop solar systems. We use Grundfos circulating pumps to fix hot water plumbing problems in both flat plate & evacuated tube type systems. The 15-20 CIL is extremely reliable and has been designed to be used with solar hot water systems. When replacing solar hot water circulating pump we always replace the non return valve. Where possible we will recommend you install the Grundfos 15-20 CIL into an external pump station housing. One thing that is commonly missed resulting in over size pump replacement is the head rating on a pump is a static rating, and applies to the maximum head in an open loop system, such as pumping up to a roof tank. In the case of circulation through a roof panel and back down a return line, once the system is primed the weight of water falling down the return line is equal to the weight of water in the feed line. Essentially the pump only needs to overcome the total pipe friction in the system. When you take this into account the limitation is more to do with pipe length than the height. The housing is a composite material, made by injection moulding, using collapsible core technology. The Grundfos 15-20 Cil can be used as a replacement pump* for all open loop solar systems, both flat plate & evacuated solar hot water systems. Below we have listed the major manufacturers to assist your circulating pump selection. The Grundfos 15 20 cil circulating pump is from the Grundfos Solar range and has been made to last.